By Queensland Museum Curator of Queensland stories, Tracy Ryan. Queensland Museum’s social history collection receives a lot of donation offers each year, and sadly many of them are refused for various reasons, one of which is a lack of provenance. But when we were approached last year with the offer of a bicycle called the Solar Tandem, we got pretty excited. Here was an object that ticked all our boxes. Not only was it Queensland-designed and made, it had also made national and international headlines. And as a bonus, it incorporated energy ideas that are still being hotly debated three decades later. The Solar Tandem, later named Supernova Australia, was unveiled in 1984. It is a four-seater bicycle that is powered by a combination of human effort and sunshine. Even at the time solar power was not new, but this bicycle took it one step further by including technology that allowed the human power and solar power to work in harmony at maximum efficiency, all without the need for conventional batteries. 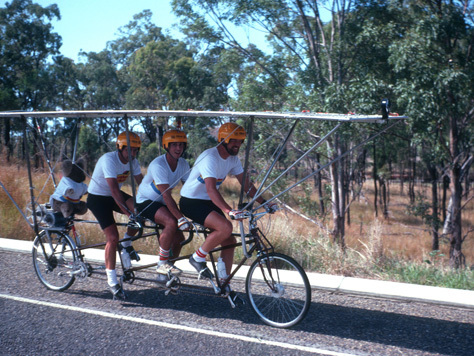 The Solar Tandem was the brainchild of researchers from the University of Queensland’s Solar Energy Research Centre (SERC), which was set up in 1979. 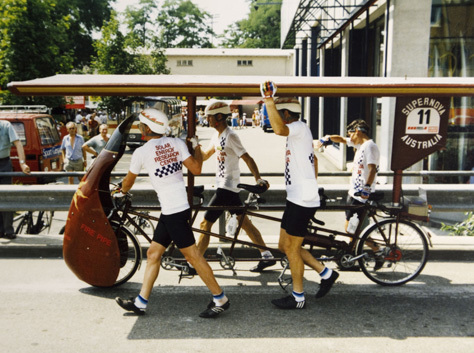 The team chose a bicycle for their experiment because bicycles are a very energy-efficient means of transport, and a tandem bicycle is even more efficient because only the front rider needs to slice through the air. So the Solar Tandem combined the efficiency of a tandem bicycle with the energy captured by the lightweight solar panel above the heads of the riders. The Solar Tandem weighs less than 100kg and it easily reached a speed of 40km per hour. During a test run on a sunny day in 1984, it exceeded 80 km per hour. 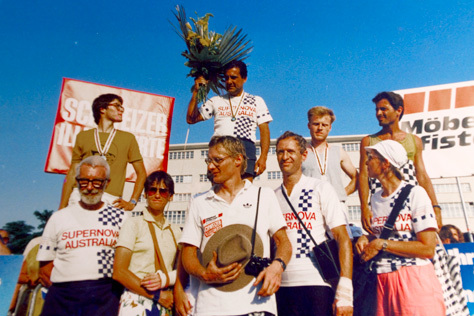 In 1985 and 1986 the bike was entered in two races for solar-powered vehicles, one in Queensland and the other in Germany and Switzerland, and it won its category in both. And because the donation came from the team involved in its development back in the 1980s, we were able to collect their first-hand accounts of their experiences with the object, something that can be easily missed as the years pass. Often donated items go into the Museum’s stores with no plans for display, but the Solar Tandem arrived just in time for an exhibition Queensland Museum is hosting at Southbank – the National Museum of Australia’s touring exhibition, Freewheeling: cycling in Australia (until 8 June 2015). The Solar Tandem is on display in the exhibition, along with images, quotes and other information collected from the donors. Adding to the display is a short film about the bike produced by Oktay Ortabasi, the son of the lead researcher of the Solar Tandem back in the 1980s. The film focuses on the two races and intersperses original footage with interviews with the Solar Tandem team. It is particularly effective, as the team members absolutely glow with pride as they recall the events of 30 years ago. So now the Solar Tandem is getting its second day in the sun here at the Queensland Museum. When the exhibition is over, it will remain in our collection as a testament to a group of Queenslanders who dreamt of creating a solar/human hybrid vehicle. In 2014 the Solar Tandem was generously donated to the Queensland Museum by the Supernova Consortium: Stuart Wilson, Jim Allison, Ted de Boer, Ray Barton, Geoff Dwyer, Mark Morrisson, Ugur Ortabasi and Oktay Ortabasi.